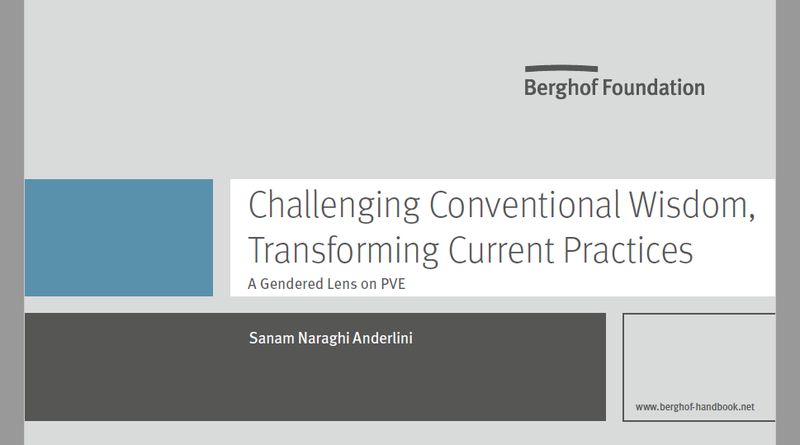 In her paper, Challenging Conventional Wisdom, Transforming Current Practices: A Gendered Lens” Sanam Anderlini contributes to the newly published Transformative Approaches to Violent Extremism, Berghof Handbook Dialogue Series 13 on Preventing Violent Extremism. Anderlini offers a framework for a shift in the discourse and practice of C/PVE, she argues that to be effective in ending violent extremism, an agenda that is not only ‘against’ extremism, but also pro-peace, resilience, equality and pluralism (PREP) must be articulated. In responding to Abu-Nimer’s framing article, this paper offers points of agreement and difference in an effort to deepen our collective understanding of the phenomenon of violent extremism and the responses needed to enable effective transformation. It does so first by offering a conceptual shift to move beyond limitations of the current terminology and discourse. Second, it provides an overview of the relevance of identity to VE with particular attention to the centrality of gender to the ideology, recruitment and action of violent extremists, as well as the importance of women in particular in countering, preventing and providing clear alternatives to such groups. In doing so, it challenges Abu-Nimer’s assertion (2018, 7) that the inclusion of women is often externally driven and that they are thus being instrumentalised.